I am the Grand Father Initiator of Mastery. From the God Source, Lord Melchizedek’s multi-dimensional self, embodied on Earth through Psychic spiritual activation’s to illuminate the path of unification. He lived upon the Earth in Lemuria and Atlantis as well as being on Earth during Jesus’ time here. In Atlantis when the darkness invaded many Atlanteans were called to the great Temple of Poseidon. Melchizedek performed the great Light Teachings to initiates, to hold their light for the gloriousness of God’s Love. Many beings have been reincarnated that hold the keys of the order of Melchizedek, the ancient geometry that was embodied into the cells of those to enlighten with these teachings. He came to bring the principles of Universal Law of the light for humanity to the one-ness of all creation. Through his lives, the mission was to teach the awareness to manifest through universal Love and to receive and give through the source teachings. 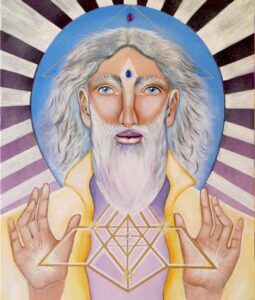 This painting of Lord Melchizedek shows his radiant light of source. His hands of great healing bring forth the Merkaba body of light, through the ancient geometry. He activates the light of Mastery within you.